A major use of CES has been in the drug abstinence syndrome in which people are withdrawing from various substances of addiction, such as nicotine, alcohol, prescription drugs, cocaine or heroin. All such patients have anxiety, depression and insomnia as defining symptoms of the syndrome, and the vast majority benefit dramatically from the use of CES during the withdrawal period. 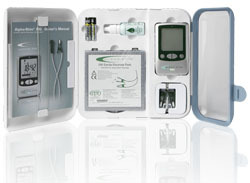 The medical use of CES is becoming more widely indicated in the USA as these and stress from a myriad of other sources continue to build up in our society. 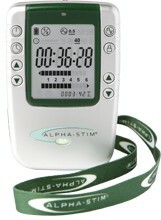 Read more about the mechanism of Alpha-Stim® CES. Power Source: Two AAA 1.5 volt batteries (included). Replace with disposable batteries (lithium preferred). Timer Settings: 20, 40 or 60 minutes. Current: 0 to 500 µA adjustable in 50 µA increments. Frequency: 0.5 Hz (pulses per second). 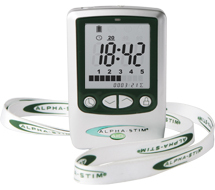 Each Alpha-Stim® AID is warranted to be free from defects in materials and workmanship under normal use for a period of five years except for replacement of batteries and accessories. See Owner’s Manual for complete details.